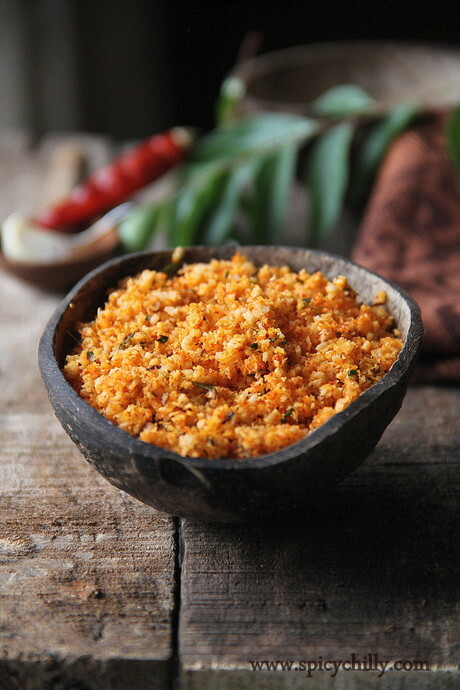 Spicy Chilly: Spicy and Flavourful 3 minute Coconut Garlic Powder! Spicy and Flavourful 3 minute Coconut Garlic Powder! I am confused how to name it! Thenga podi to please the Keralites? Thengai Podi to please the Tamilians? 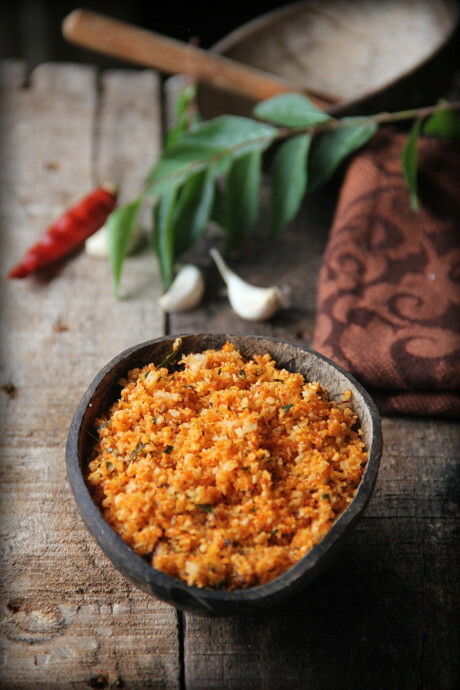 Or just the rightly named Thekkaye Podi which amma calls and makes for us from the time I can remember. She is unsure of the the nativity of this simple side dish: whether Kerala, Tamil or Andhra, but sticks on to the recipe which was my granpa's (her mama's or father-in law's) favourite side dish for dosas. How soon can you make this ready? Within 3 minutes! For certain, if you have grated coconut ready in the chiller. I make this quick accompaniment while the idly is being steamed or the dosa getting cooked on the stove and my family with dinner plates on the dining table! Gently combine, rubbing in the chilly powder and salt in grated coconut for a few seconds, in a bowl. Toss in garlic pods and curry leaves. Pulse, in quick shots, once or twice in your mixie, and you are done! Adjust the amount of garlic pods if you use the plumper varieties. You may not need more than 4-5 pods if they are larger in size. Slice lengthwise to slender pieces before you pulse for even mixing up. 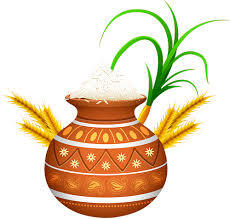 I use the slender Tharai poondu or the nattu poondu (nadan veluthulli) as pulse as such. The grated coconut used to make this accompaniment should not be tender and slimy. 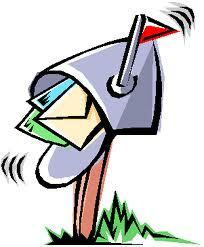 It must be towards the coarser and matured side. The final powder after you pulse should retain the 'crumble' texture. Let the curry leaves you use be fresh for the accompaniment draws the best flavour from them. 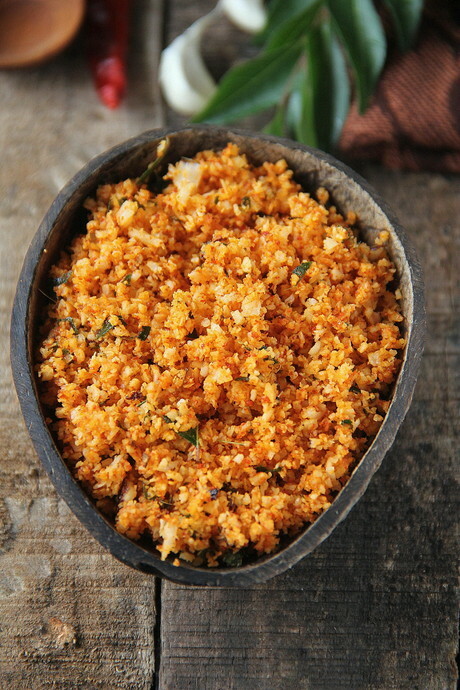 -->The flavourful തേങ്ങാപ്പൊടി / Thenga podi can be had with idly or dosa with a few drops of coconut oil drizzled in. -->The tasty தேங்காய்ப்பொடி / Thengai podi is happy to have a few drops of nallennai or sesame seed oil drizzled instead too! 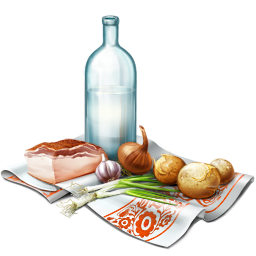 I prefer to have with no oil or as such, as mentioned earlier as a quick accompaniment. This is a comforting side dish for curd rice as well. i absolutely LOVE the first picture. i took photos of thekkaya podi this time in kottayam :) they are not half as nice though. Podi looks so colorful and inviting. Excellent preparation. Quick and easy podi and the photo is amazing! Hmmm...I am imagining the smell of curry leaves, coconut and garlic tickling every nerve! This flavour mix is a sure hit!